Jackson Art Studio and Gallery - Jackson NH and Mt. Washington Valley Area Information. Pumpkin People, Tradionally Yours Events, Lodging specials, Dining and Ski Area Info. Jackson Art is a working studio and gallery featuring the work of local artist and artisans. It also offers classes for adults, teens and kids in variety of different media and settings. 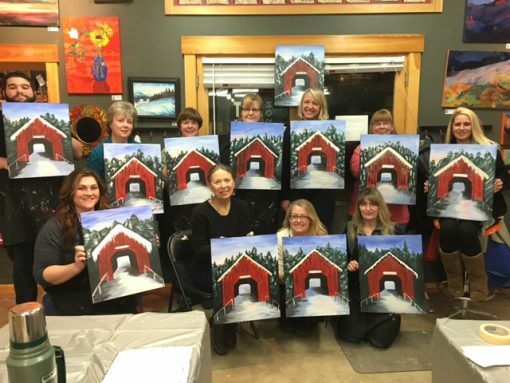 Check out the highly popular “Sip & Paint” classes, where you paint along with the instructor and leave with a finished painting in a day or evening BYOB session. A short walk uphill from the centre of Jackson and well worth a look. Very limited parking near to the access to the fallls - walking advised.